A Viking hoard of silver coins and artefacts uncovered in the Cumbrian countryside has been formally declared treasure. 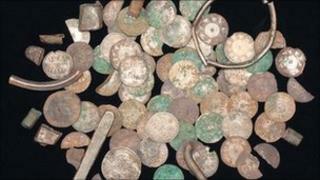 A metal detectorist discovered the 92 silver coins and artefacts at an undisclosed site in Furness earlier this year. South and East Cumbria Coroner Ian Smith ruled the collection is treasure. Barrow's Dock Museum hopes to acquire the hoard and curator Sabine Skae said she was "delighted" with the decision. The collection was provisionally valued at tens of thousands of pounds. As well as the coins, the hoard includes ingots and a silver bracelet. Among the coins is a pair of Arabic dirhams. Experts believe it is significant evidence of material culture of the 9th and 10th Century Vikings in the peninsula. British Museum experts examined the finds before giving their verdict to Mr Smith. The hoard will now be valued by an independent committee. Once a find is declared treasure, museums are given the opportunity to acquire it. Ms Skae said: "I am delighted with this. It's not a surprise but it's a really important stage in the Dock Museum trying to acquire the Viking hoard for Barrow. "It's an exceptional find. It's particularly exceptional for Furness. "It really places us in the Viking kingdom. It's really putting Furness on the map in terms of our place in England at that time."